With the fielding of increasingly capable anti-ship missiles, the centerpiece of the next conflict with a near-peer maritime power will be warfare to deny the adversary the intelligence, surveillance, reconnaissance and target acquisition information required for successful anti-ship missile attack on surface combatants and capital ships. Land, air, surface ship, and submarine launched anti-ship missiles are and will increasingly be the dominant threat to surface navy operations. 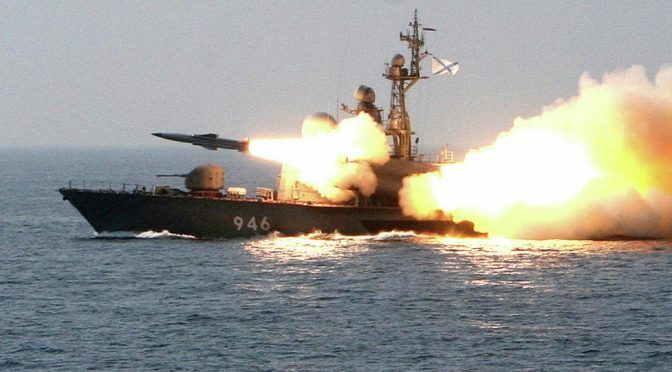 Ballistic anti-ship missile systems such as the Chinese Dong Feng 21 (DF21D) and Dong Feng 26 (DF26); hypersonic anti-ship missiles such as the Russian 3M22 Zircon (NATO SS-N-33); and, anti-ship cruise missiles leveraging artificial intelligence for threat avoidance and target acquisition dramatically increase the threat and severely challenge the anti-ship missile defense capabilities of the surface navy. The trend favors the offense. The longstanding and current investments in fleet kinetic and electronic defense against incoming launch platform or inbound anti-ship missiles will remain necessary but increasingly insufficient. A sea-skimming, Mach 6, ZIRCON anti-ship missile, breaking the radar horizon at 15nm from a surface target, would impact the ship in approximately 15 seconds. With these short reaction times the likelihood of a navy surface ship detecting and destroying the incoming missile is low. 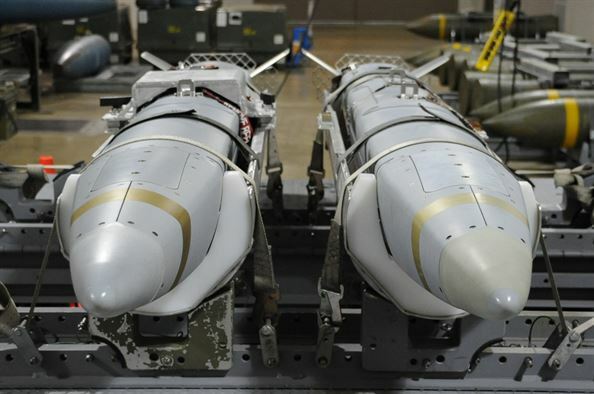 One way to offset this dramatically increased threat is to counter the adversary’s intelligence, surveillance, reconnaissance (ISR) and target acquisition (TA) capabilities. Even the most sophisticated anti-ship missile systems are dependent on a chain of events starting with intelligence to support the targeting decision process, followed by reconnaissance and surveillance to find the target, and ending with weapons effects on the target. It includes the communications and data links for the transfer of information along the kill chain and the command and control decisionmakers. The attack will be unsuccessful if any of the links in this anti-ship missile kill chain are broken. The concept of a kill chain is well established in the U.S. military as evident in terms such as Sensor-to-Shooter; Observe, Orient, Decide, Act (OODA); and Find, Fix, Track, Target, Engage, and Assess (F2T2EA). Though similar in concept, the kill chain for anti-ship missile attack against moving maritime targets requires a detailed decomposition to identify the links in the chain of events that must be completed for attack success. The following is a representation of a notional anti-ship missile kill chain. 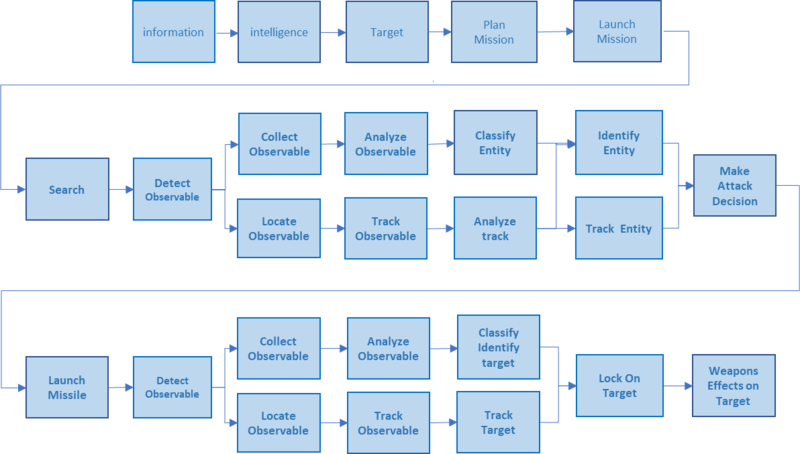 The links in the kill chain that reference “observables” all depend on own force/own ship offering visual, infrared, acoustic, RF (radar, communications, data links) observables that can be exploited by the adversary to complete the kill chain. In addition to technical observables, the operations of the force/own ship offer observables such as course, speed, and formation from which to deduce that the entities are military and that entities being screened by a formation might be the highest value. Many of the observables that can be exploited by the enemy to acquire this information can be controlled or manipulated to degrade links in the enemy’s anti-ship kill chain. In response to the rapidly evolving threat, the Navy needs a strategy that officially recognizes the requirement and places high priority on breaking the anti-ship missile kill chain. There are several elements to the execution of this strategy. First, it requires very detailed intelligence on the end-to-end kill chain for each type of anti-ship missile, identifying, locating, and assessing the technical characteristics and performance of each link in the chain. Second, it requires operational intelligence on how a potential adversary actually uses or trains to operate the kill chain for each type of missile. Third, it requires analysis of the observables offered by U.S. Navy combatants that could inform an adversary’s kill chain. Having knowledge of all three elements, the analysis can be performed to identify both material and non-material alternatives; and assess their effectiveness, technical and operational feasibility, probability of success, and costs. Breaking the anti-ship missile kill chain requires a response that integrates a variety of national, theater, and Navy information-related activities executed ashore and afloat. Composite Warfare Commanders and their supporting Information Operations Warfare Commanders will be required to have detailed knowledge of adversary ISR and TA systems and their capabilities. They will require situational awareness sufficient to determine whether the force is within enemy detection range, and assess whether the adversary has located and identified the force. This assessment drives the decision of if and when to transition from denying observables to active electronic and kinetic defense when it is tactically advantageous. It will also require creation of a new warfighter career path focused on countering enemy ISR and TA and breaking the anti-ship missile kill chain. This career path would be technically challenging, requiring personnel educated in the physics of the various types of sensing, such as satellite reconnaissance, Over-The-Horizon Radar (OTH-R), Inverse Synthetic Aperture Radar (ISAR), time difference of arrival (TDOA), frequency difference of arrival (FDOA), imaging and non-imaging IR, and acoustic systems. The knowledge of physics at work in the acoustic, atmospheric, and ionospheric environments and in the various types of sensing systems has to be followed by knowledge of how various techniques are employed by adversaries along individual steps of the kill chain when hunting surface ships and aircraft. This foundation of knowledge forms the basis for the conceptualization and testing of new concepts, formulation of new requirements, the fielding of new systems, the development of doctrine and tactics, and manning of the fleet with ready warfighters. 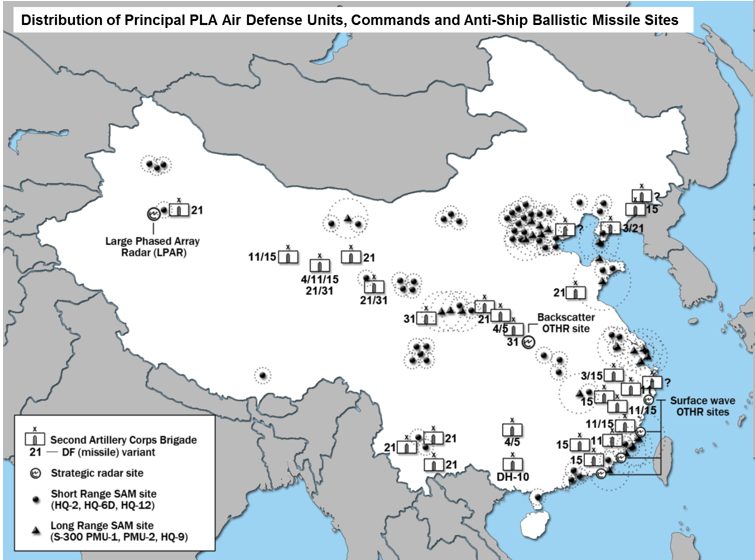 In summary, the fielding of ballistic and hypersonic anti-ship missiles by Russia and the China constitutes an alarming increase in the threat to U.S. Navy surface ships. It demands a strong, focused, offsetting response aimed at defeating these new weapons by breaking their respective anti-ship missile kill chains. This strategy will be successful only if it is treated as a major new direction for the U.S. Navy, with sustained high-level support, strong organization, and innovative leadership. Rapid technological advancements and the re-emergence of near peer competition require that we continue to invest in high end tools – platforms, weaponry, and sensors. 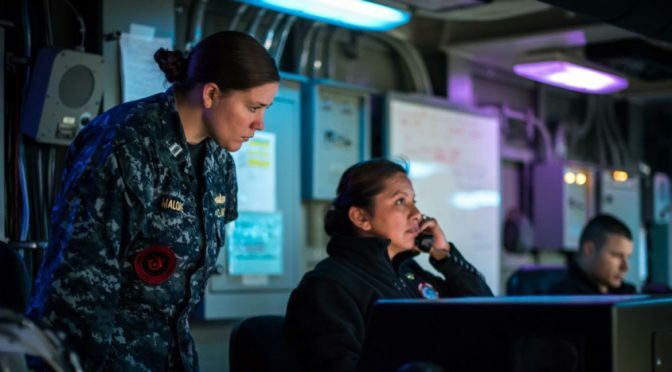 Equally important are the tactics to employ them and the associated training investment we must make in today’s warfighters and future leaders in the Surface Warfare Officer (SWO) cadre. 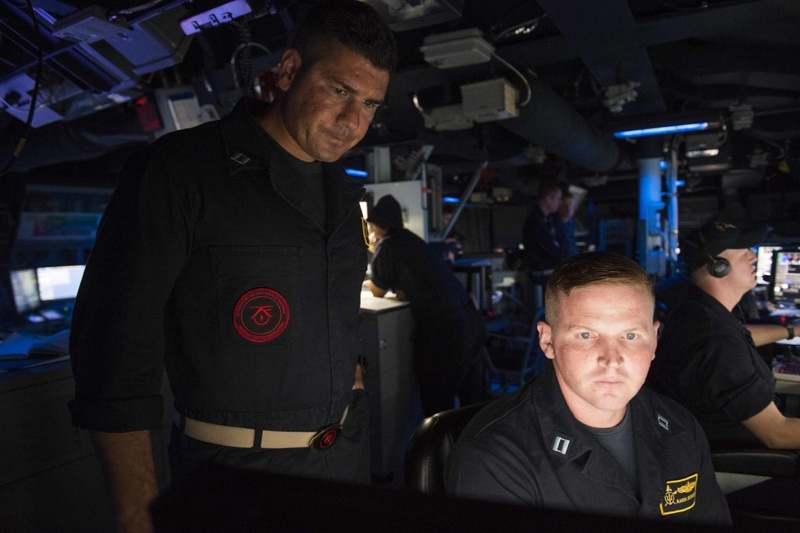 The centerpiece of an amped-up warfighting culture in surface warfare is the Warfare Tactics Instructor (WTI) program, available to all division officers, department heads eligible for shore duty, and a small number of limited duty and chief warrant officers. The ideal onramp into the WTI community is during the first shore tour following completion of at-sea division officer assignments. This timing allows the WTI program to fit neatly in a career pipeline. Three attributes set the WTI program apart: the opportunity to develop expertise in areas the Navy needs, exposure to exclusive professional development opportunities during the readiness production tour and throughout a career, and the empowerment to make significant contributions at a very junior level. The ability to develop confidence through professional expertise early in a career has a profound accelerating effect on an officer’s development, and directly contributes to a sense of purpose and fulfillment. WTIs are afforded the time, resources, and experience-building opportunities they need to learn while making substantive contributions to tactics and warfighting proficiency. 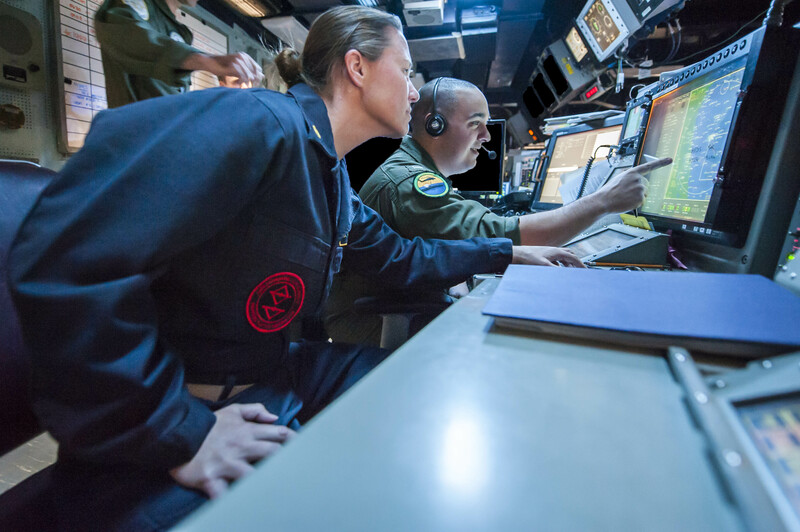 The WTI program offers a gateway for young officers to develop deep tactical expertise in the fields of Integrated Air and Missile Defense (IAMD), Anti-Submarine/Surface Warfare (ASW/SUW), and Amphibious Warfare (AMW). Each field begins with a two week Instructor and Tactics Course (ITC) followed by a tailored, 14-16 week course of instruction. During this instruction period, prospective WTIs are mentored and coached to develop their skills at leveraging the Plan, Brief, Execute, and Debrief (PBED) methodology for rapid learning. Following this training, WTIs complete a 24-month “readiness production tour” at SMWDC headquarters or one of four SMWDC Divisions – focused on Sea Combat, IAMD, AMW, or Mine Warfare – or selected training commands (CSG-4/15, TTGP/L, ATG, CSCS, or SWOS, to name a few). During this tour, WTI skills are matured both in the classroom – and at sea – during Surface Warfare Advanced Tactical Training (SWATT) and other fleet training events. The emphasis on teaching as a basis for learning is based on an idea espoused by the Roman philosopher Seneca, who declared, “docendo discimus” or, “by teaching, we learn.” This model of learning is also used to develop WTI candidates, which is why instructor skills are a main focus of ITC. Quality of lesson delivery is established through a rigorous standardization process that must be completed for each lecture delivered by a WTI. It’s not uncommon for a WTI to invest weeks or months of research, as well as conduct numerous “murder boards” with fellow WTIs, technical experts, and senior officers, before presenting at the podium. The process is meant to maintain a high standard of instruction where WTIs have established mastery of content and exhibit confidence in delivery. During initial WTI training, students are assigned relevant tactical projects that match critical fleet needs and account for student interests. Projects often involve new technology or capability that must be thoughtfully and effectively integrated into maritime warfare doctrine. Other projects center on updating existing doctrine or repurposing existing systems in new and innovative ways. Specialty areas and projects are assigned based on WTI preference and crosscut broadly, from high-end tactics to training systems and learning science. Focus area research often extends past initial WTI training, into subsequent readiness production tours, and beyond. SMWDC provides mentorship, applies resources, and opens doors to connect WTIs to thought leaders, technical community experts, industry partners, and community leaders to develop their specialty area work. WTIs are the core workforce of SMWDC’s advanced tactical training at sea. They rely on replay tools that include systems data, voice, and other information to rapidly build ground truth and facilitate debrief sessions. Equipped with irrefutable data on what really happened, the “I thought” and “I felt” ambiguities are driven out of the debrief process, enabling shipboard watch teams to learn and grow together more rapidly. The combination of WTI knowledge, replay-assisted PBED, and specialized training focused on team dynamics and coaching skills offers a powerful method for improving learning across the fleet. The aim is to create an environment of transparency and mutual trust among watch team members, where Sailors enter debrief sessions eager to identify their own shortfalls in order to improve team and unit performance. At-sea training allows WTIs to observe multiple ships and teams across a variety of training and operational circumstances. The WTIs gain practical insight into how doctrine plays out on the deckplates, as well as hone their ability to identify team performance issues during at-sea training. While the immediate objective is to improve tactical proficiency and unit performance, the skills WTIs gain are extraordinarily useful in future roles as department heads. The final link in WTI expertise development leverages the strong partnership between SMWDC and the technical community. Our ability to measure and analyze performance among units is a challenge due to complex weapons systems, ship configuration variance, and the number of watchstanders distributed in different controlling stations. To build a clear picture of how tactics, training, and systems converge into warfighting capability, a detailed event reconstruction must take place that considers system actions, operator actions, and tactics. Naval Surface Warfare Center (NSWC) Corona, Naval Undersea Warfare Center (NUWC) Keyport, and SMWDC have developed a Data Analysis Working Group (DAWG) to conduct performance analysis of SMWDC training events. The intent is to extract empirical, data-driven insights from the careful analysis of systems, operators, and tactical performance. The process is laborious, but straightforward. Following at-sea training, event data is extracted from unit combat systems and sensors and then brought to NSWC for detailed analysis. Following initial analysis from the technical community, WTIs and SMWDC leaders stand up a 1-2 week DAWG event. By examining system performance, operator performance, and tactics as a consolidated effort, the process can lead to discoveries not captured by direct observation – system anomalies, operator actions, and flaws in tactics. Findings and lessons learned can be very useful because they are underpinned by empirical data and technical analysis. To date, more than 40 weapons system performance anomaly reports have been generated from DAWG events. Systems issues have been identified and funneled to the appropriate technical community to resolve, tactics have been updated, and numerous operator performance issues have been provided to the training community as opportunities to grow or strengthen curriculum. This allows SMWDC to advocate for tactical updates among partner warfighting development centers and provide feedback to the TYCOM and Surface Warfare training enterprise. For the WTI, immersion in performance analysis activity with civilian technical experts offers a unique lens into how weapons systems, operator performance, and tactics are all linked to create combat potential. Because the program is highly sought after by driven, focused professionals, the majority of WTIs are on track to return to sea as department heads. Notably, WTI cadre retention is double historical averages in the Surface Warfare community at roughly 70 percent. WTIs heading back to sea have a notable advantage given the training they receive and the experiences they gain at a formative stage of their career that others simply do not. Similar to officers with other subspecialty skills – Nuclear Program, Financial Management, Operations Analysis, and Space Systems – WTIs have unique skillsets based on their focus areas. For example, IAMD WTIs in readiness production tour billets at the Naval Air Warfare Development Center in Fallon, Nev., have completed the Carrier Airborne Early Warning Weapons School, becoming dual-patched WTIs. These officers are among very few in the Navy with expertise in Integrated Fire Control (IFC) from both the Aviation and Surface perspectives. To maximize the return on investment for these unique WTI skills, SMWDC is closely aligned with PERS-41 in the distribution process, ensuring future assignments leverage these strengths (e.g., assigning a WTI with IFC expertise to IFC-capable units). While assignments will always consider many variables, this close relationship ensures WTI experience and skills are considered during the assignments process. WTI training and readiness production tours leave less time to complete graduate education between division officer and department head assignments. To mitigate this challenge, WTIs are awarded priority for graduate degree programs at service colleges as well as the Naval Postgraduate School distance learning programs. Additionally, WTIs are afforded unique and exclusive professional development opportunities that extend throughout their careers. Annual “Re-Blue” events held at SMWDC Divisions are a venue for WTIs, both in-and-out of readiness production tours to attend week-long immersive workshops where information is exchanged and re-distributed into the fleet. Funded travel to Re-Blue events keeps WTIs connected to the sharp edge of the operational Fleet during their readiness production tours and beyond. Re-Blue events are an example of SMWDC’s commitment to maintaining excellence within the WTI cadre. SMWDC is unlocking the potential of our junior officers and post-department heads, empowering them to swarm and solve difficult problems. While experience will always have a place at the table, this new generation of naval officers holds several key advantages. Unencumbered by “the way things have always been,” these officers are better suited to envision a future that leverages trends in technology, communication, and learning. This is an area where fresh perspective is an asymmetric advantage. WTIs bring their creativity, ingenuity, and initiative to developing the next generation of cutting-edge tactics, techniques, and procedures. WTI’s are creating a positive impact in the Fleet. From immersion in their focused specialty areas to tactical projects, and deckplate innovations, WTIs have built an impressive list of contributions since SMWDC’s formal establishment in June 2015. Consider the below examples of projects inspired, developed, and built by WTIs, while being supported by SMWDC leadership. Lt. Cmdr. Katie Whitman was the lead action officer developing the SWATT in port and underway curriculum from the ground-up, using best-of-breed practices culled from aviation and other communities. She developed replay-assisted PBED for rapid learning and crafted the SWATT performance analysis strategy, which are now distinctive features of the exercise. Lt. Ben Graybosch partnered with NUWC Keyport to revise the VISTA replay tool to include A/V-15 sonar system data, enabling the detailed “ground truth” ASW replay for unit sonar teams within 4 hours of completing ASW events. Graybosch’s effort moved the needle on ASW ground truth replay availability from days or weeks down to hours after an event. With replay tools that offer ground truth much earlier, we can increase the velocity of learning within surface ASW teams dramatically. VISTA is now employed in every ASW event supported by SMWDC and other fleet training events. Lt. Brandon Naddel was the lead author for the Naval Surface Gunnery Publication released in 2017. Naddel and his team revised a 15-year-old document laden with technical jargon and dated systems into an information-packed and easily understood tactical publication relevant to all surface ships. Lt. Tyson Eberhardt authored tactical guidance for the emerging Continuous Active Sonar (CAS) capability. Eberhardt leveraged at-sea training and experimentation events to rapidly refine tactical guidance in 2017. Based on his work, the CAS capability was used to great success in the operational fleet later that year. Lt. Matt Clark designed and built a Target Motion Analysis (TMA) training tool accessible on any classified terminal with built-in performance analytics. Clark’s tool has potential to provide insight on the rate of individual skills decay in TMA. This type of information could then be used to inform currency thresholds for future training requirements. Lt. Aaron Jochimsen was the lead author for the SM-6 TACMEMO. He conducted extensive research on SM-6 that included production site visits, participation in wargaming and experimentation, as well as involvement in fleet missile firings. Chief Warrant Officer Troy Woods completed a readiness production tour with the Center for Surface Combat Systems, where he was involved in training individuals and teams on IAMD skills. Woods was subsequently assigned to USS BUNKER HILL (CG 52), where his skills are being put to use as lead IAMD planner within the Theodore Roosevelt Carrier Strike Group. Woods attended the IAMD WTI Re-Blue event in Dahlgren, Va., to share the operational perspective with his fellow IAMD WTIs and receive the latest tactical information from SMWDC IAMD Division leadership. The WTI cadre of warriors, thinkers, and teachers are uniquely equipped with the experience and knowledge to make significant contributions during their readiness production tours and throughout their careers. It is no coincidence that the same skills involved in developing tactical mastery are extraordinarily useful in subsequent assignments at sea – department head, XO, CO, and major command. While statistically significant trend data does not yet exist for WTI selection for career milestone billets, members of the WTI cadre performed very well during recent administrative boards. For those looking to increase their confidence and competitiveness for future at-sea assignments, the WTI program offers a unique opportunity to strengthen their professional attributes and shape the Navy for years to come. Rear Admiral John Wade is Commander, Naval Surface and Mine Warfighting Development Center. Commander Jeff Heames serves as the assistant chief of staff for operations, training, and readiness for Naval Surface and Mine Warfighting Development Center. During a recent CIMSEC topic week, the idea of the “Future Capital Ship” was discussed. This hypothetical asset was depicted several different ways that week. Transplanting the idea of the twentieth century battleship or aircraft carrier to the near future, this conceptual combatant could be bristling with railguns and directed energy weapons, in lieu of an “all big gun” dreadnaught’s armament. It could also be the mothership to many cross-domain unmanned systems, an update to the aircraft carrier archetype. Some viewed “capital ships” of the future as swarms of unmanned systems operating autonomously, a complete disruption in naval warfare akin to the first dreadnaught – eliminating the need for a manned vessel entirely. Taking a different route, the organizational investment that was put into the capital ships of the past could be applied in a way that transcends the idea of physical warfighting platforms. The CNO Strategic Studies Group 35 used that thought experiment to point out that the Navy of the future should treat the “Network of Humans and Machines” as the future capital ship. The argument was also well-made that investments in information warfare and cyber capabilities should be at the forefront, even to the extent that the U.S. Navy will eventually evolve into a cyber force with a maritime component. These concepts are all deserving of consideration, and the future Navy will most likely be a combination of many of them, but the major foundation of naval power is usually an afterthought. The dominant Navy of the future will be the one with the most robust and adaptable logistics support structure needed to succeed in the future high-end fight as well as maintain command of the seas in peacetime through sustained global presence. Aggressive recapitalization of the Combat Logistics Force (CLF) is needed because the Navy’s current logistics force structure is unprepared to support a distributed fleet in a fight against a peer competitor. There are fewer than 40 hulls in the CLF, a mix of oiler (AO and AOE) and dry cargo (AKE) supply ships of differing types. It is impossible employ them all at once, so the effective number of usable hulls is in fact lower for they require upkeep like every other vessel. They are incapable of defending themselves from anything other than limited numbers of lightly-armed small boats. This leads to the unfortunate conclusion that a limited number will be available to replenish shooters in the fight – if they can survive an area denial battlespace. In a high-end fight, they will become prime targets, and providing escorts to CLF assets only takes shooters away from the fight. But given the logistically-intensive nature of naval power projection, CLF ships will take on capital-ship value in a tightly contested conflict. The force structure of CLF ships we have today is based off of their employment in the older model of hub-and-ferry routing, centered on specific ports in overseas Areas of Responsibilities (AORs). 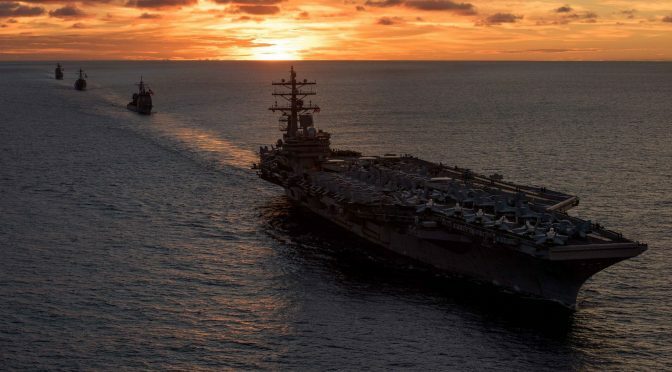 As the Navy moves toward fighting as a distributed fleet, it creates a complex variant of the travelling salesman problem (TSP). Familiar to anyone who has taken an operations analysis business course, TSP looks for the optimization of a route that passes through a set of points once each. Cities or houses in a neighborhood are often the problem set. In a disaggregated environment, a replenishment asset must do the same (if its customers have to stay in the fight), but the difficulty is compounded by the fact that the delivery locations will be moving targets and the distances between them will stretch around threatened areas and land masses. The academic TSP problem seldom includes the possibility of the salesman getting killed and never reaching the destination. In addition, naval assets are going to be limited to external lines of communication in some future conflicts. Ships will travel farther distances than their peers in the opposing force, leading to longer transit times between shore support and afloat customers. Distributed naval warfare needs more “salesmen,” working together as an interconnected web of logistics assets. An enlarged fleet of combat support vessels is the base of this new support schema. Practically, this is easier done than asking for more warships. As we build a larger number of warships for the future, our military shipyards are going to reach capacity, especially if they continue to build platforms using conventional methods. New replenishment ships can be acquired in a number of ways, apart from dedicating some military shipyards to building replenishment vessels (which will take away from warship building capacity), or building them in foreign countries (which is politically unfeasible). 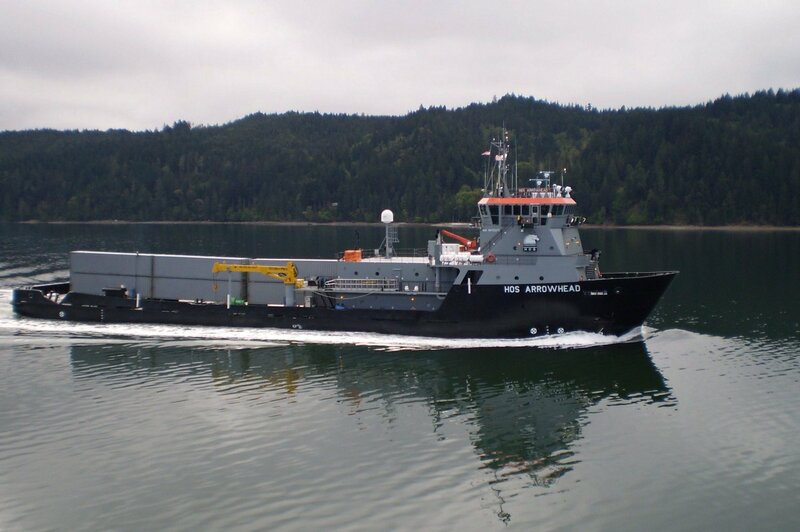 There is a surplus of offshore support vessels (OSVs) that could be purchased and put into Military Sealift Command (MSC) service, along with other commercial vessels that could be modified for CLF purposes. Modified in smaller civilian shipyards instead of military ones, they could create work that would please the constituents of a number of decision-makers on Capitol Hill. Under new CONOPs, vessels such as OSVs could be employed in shorter range replenishments to independent deployers on missions such as antipiracy and ballistic missile defense. These additional CLF vessels will still be vulnerable, especially if kept in the current MSC construct as unarmed USNS assets. Risk of enemy attack will have to be built into the calculus of how these ships are employed. But giving them sufficient self-defense weapons and damage control resilience to survive being set upon by enemy platforms would be prohibitively expensive. A larger number of our vessels would create a targeting problem – they can service more combatants, operate from more ports, and inject uncertainty into the situational awareness of an adversary. In the current model, there are only a couple of CLF vessels operating in an AOR, and watching select ports will give plenty of indications of U.S. Navy presence. These ships can be augmented with automation to the level that is currently employed on commercial vessels, allowing MSC to man more ships with the same number of personnel. An AKE in current MSC service has approximately 130 personnel onboard, while there are thousands of commercial vessels afloat with crews numbering less than 30. 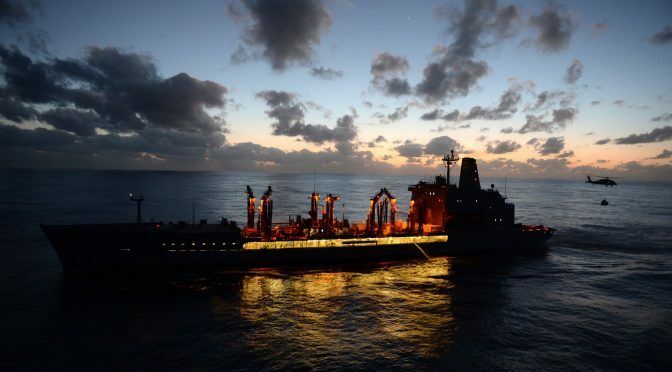 At-sea replenishment creates demands for more personnel during alongside evolutions, but this could be mitigated with updating the CONREP (connected replenishment) stations with new equipment. The receiving ship could guide the delivery ship’s systems remotely with short-range remote operation systems, supervised by a few merchantmen on the delivery ship. A fly-away crew could attend to this equipment only when needed, and not ride for long transits, or into harm’s way. To reduce the threat profile of the manned CLF hulls, a system of smaller unmanned systems would create a web of logistical support. Cargo unmanned aerial systems (CUAS) will travel hundreds of miles point-to-point to deliver critical parts, instead of sailing entire vessels closer to get within VERTREP (vertical replenishment) range. They could carry parts for multiple customers and use aviation-capable ships as lily pads to get to others. Heavier lift CUAS could carry out VERTEP from unmanned CLF vessels to delivery ships, obviating the need for sailing alongside to transfer parts in a connected replenishment with a robotic vessel. 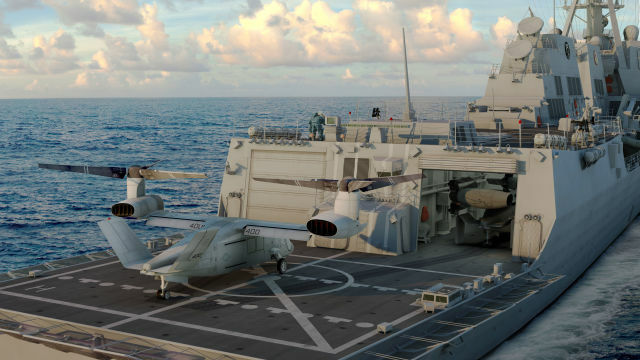 These systems would be augmented by small unmanned surface vessels, possibly based off of the Sea Hunter Unmanned Surface Vehicle (USV), that could blend into surface traffic and make deliveries in battlespaces that are not conducive to aerial vehicles. There are a number of solutions to support problems that will also be needed in the Navy of the future. Digital investments will be needed to improve our logistics IT structure to create a more resilient and adaptable family of systems. Taken to the farthest extent, this would lead to Vertical Expert Systems (specialized AI), predicting demand through data analytics and optimizing the use of delivery assets. Additive Manufacturing will allow parts sourcing from many more locations than are currently available. Underway ships could eventually have the ability to make complex parts for their use or for other vessels that lack the technology. Fuel production from bacteria and “grow-tainer” produce farms could bring commodity sourcing much closer to the fight. Adoption of these technologies is important, but they do not eliminate the need for support to be physically delivered to our combatants anytime in the near future. The counterargument to a larger fleet of CLF hulls deserves to be heard. The Navy is looking toward a 355-ship force, and most of that plus-up number would be in warships. We want a lean Navy- with as little tooth-to-tail as possible, and the idea of buying more replenishment assets seems to be anathema to that. But the Navy must recognize it is unable to fight a long-term shooting war, especially in a disaggregated manner, with the current CLF force structure. A larger fleet of combatants only complicates this problem, especially since a majority of these shooters will be powered by liquid petroleum products that have to be brought to them. To placate these concerns, these new vessels do not have to be single mission vessels, dedicated only to logistics. They could act as routers for line-of-sight transmissions, or even couriers of data packages between other platforms when they carry out their supply missions in a communications-restricted environment. They could seed sensors or deploy and recover unmanned systems in their transits. These missions could reduce the burden on warships and dedicated survey ships in peacetime and in war. 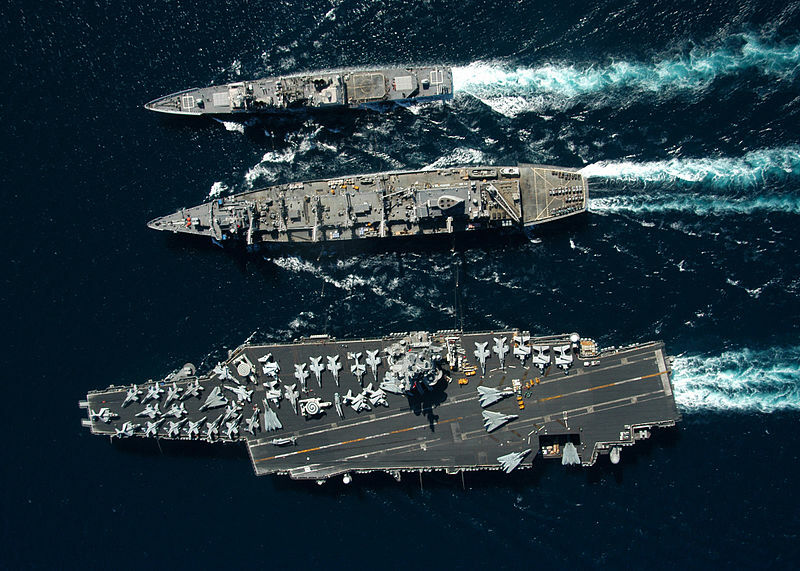 A successful future U.S. Navy will be comprised of innovatively designed combatants, with arsenals of new weaponry, employing cyberwarfare and unmanned systems to an extent that we can barely conceptualize now. They will still need a capital-ship level of investment in an interconnected web of logistics assets to fight against a peer adversary. The toilet paper, Diet Pepsi, and turbolaser parts have to come from somewhere. Chris O’Connor is a Supply Corps officer in the United States Navy and a member of the CIMSEC Board of Directors. The views expressed here are his own and do not represent those of the United States Department of Defense.